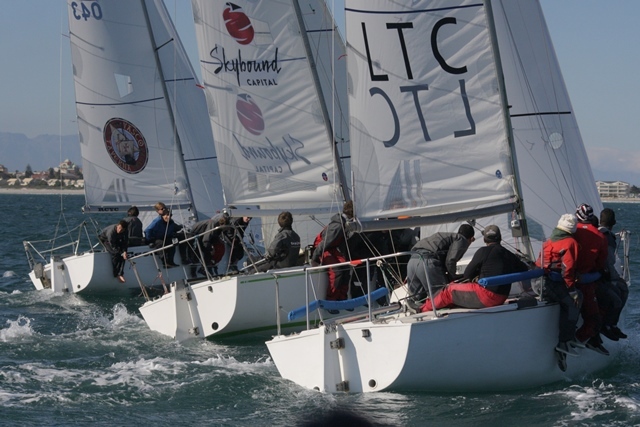 The L26 National Championships were held the weekend before Lipton Cup at Royal Cape Yacht Club. In the past, SAS insisted a National Championships had to be a minimum of four days. It was the L26 Class President, David Hudson, who was instrumental in removing this limitation so that a two-day nationals could be held, and the L26 Class proved this year that if the venue is well chosen for the prevailing conditions at time of year the nationals are scheduled, a fantastic national champs can easily be achieved in two days. Registration took place in the afternoon on Friday 3 July and by 18h00 all crews were registered and weighed. The scheduled start of racing was 09h00 for the two scheduled race days, Saturday and Sunday 4-5 July, and while this meant an early start for the teams and organisers, it worked really well. RCYC were fantastic hosts and on board with the early start and the club was alive and bustling, serving breakfast at 07h00 every morning for the competitors. The Race Officer was seasoned SA Race Officer John (Spilly) Spillhaus and his wife Erika, who ran a seemingly effortless bridge with efficiency – perfect courses and no waiting around for the competitors. On the first day’s racing, the bridge was out on the water by 08h00, waiting for the wind in the early morning sun. Spilly kept the fleet ashore which gave the competitors the fleet an opportunity to catch up on some pre-Lipton boat work, and for the seasoned L26 sailors to assist the younger teams with rig set up and advice. David Hudson organised a Q&A session with Greg Davis and so the time ashore was used valuably. The Westerly came up around lunchtime and the fleet was sent out and did two and a half races in the light Westerly before it died and the South Easter came up and Race 3 had to be abandoned. Spilly and mark layer Morgan Evans wasted no time in moving the course into the SE wind and without any delay, the fleet found themselves sailing their third scored race of the day in a moderate South Easterly, finishing just after 17h30. All in all, a valuable day ashore and on the water. Sunday saw a moderate Southerly/South Westerly wind from the very beginning of the day and racing started at 10h00 after the morning fog had lifted. After four challenging races in wind speeds starting at 15-20 knots and dropping down to around 8-10 knots, the fleet were exhausted after five hours of solid racing and so at around 15h30, Spilly had mercy on the sailors and called it a regatta. Seven good races over two days, with the opportunity to do another one or two – and this despite waiting for wind for half a day! The L26 Class and Spilly showed that a professional two day nationals can certainly be achieved at the right time of year for the venue. The racing was of a very high standard indeed – both from the seasoned L26 sailors and the many junior teams, and the racing was close. It was also great to have two all-women teams competing – the Wits Ladies Team, skippered by Megan Eccleston, and the ZVYC Tiletoria Tea, skippered by Heidi Burger. They will also be competing in the Lipton Cup, the first time since 2010 that an all-women team is competing. 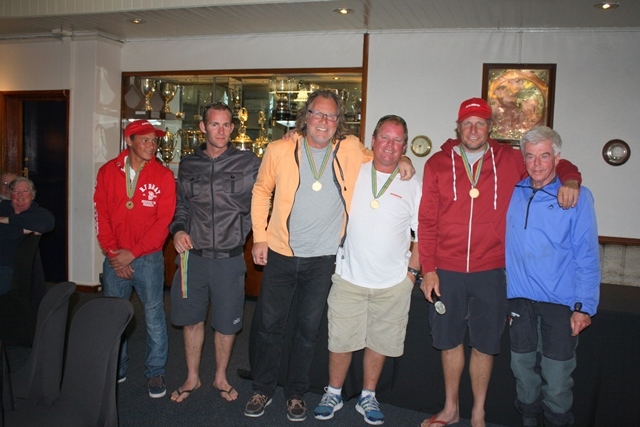 Greg Davis and Dave Rae’s team from RCYC on Coordination showed us that they are still the masters of the L26 and deservedly won the gold medal. From the bridge, I could not help note that they were the first boat out every day – checking the line, sailing the first beat, getting their race strategy together and consequent perfect starts, and setting an example to the other teams as to how it should be done. It must be mentioned that it was a pleasure to see such efficiently and well-organised protests run by Protest Chair Luke Scott – prizegiving started on the Sunday, even with a protest, before many of the competitors had even had a chance to change out of their foulies – what a pleasure to not wait around after two hard days of racing! On behalf of the L26 Class, a massive thank you goes to RO Spilly and Erika Spillhaus for such an exemplary job, RCYC for hosting the event and for their early start each morning and use of all the equipment, Morgan Evans and Warwick Strutt for super-efficient mark laying, Luke Scott for running the protests so professionally, and the bridge helpers Mary-Ann Sharwood, Andre Bestha, Dave Garrard and Alistair Peadan. Last but not least – big kudos to Dave Hudson for the massive effort he puts into the L26 Class, the sport in general, and into the regatta, and WC L26 Class Chair Ian Slatem for the weeks of effort that has gone into the technical and practical side of the nationals and Lipton, and Dave Herman and Harry Brehm from the L26 Class in the Western Cape. The hard work and effort that Harry puts into L26 sailing through the RCYC Sailing Academy are nothing short of legendary. We look forward to seeing more two-day national championships as successful as the L26 Nationals 2015 was.